The mighty party Edward Carson once led with iron-fisted certitude is now stumbling, drunkenly towards an inglorious end. Surveying turmoil around him, Mike Nesbitt, the current leader of the once all-powerful Ulster Unionist Party (UUP), might now think he would have been better advised to try reality television than attempting to fill the position once occupied by men like James Craig and John Andrews. In his desperation to succeed, Nesbitt is staking everything on a strategy that is ill judged and ill advised. The outcome of his gamble is unlikely to save his leadership or his party and most certainly will not enhance unionism. Due perhaps to years spent in media circles rather than at the coal face of politics in Northern Ireland, Mike Nesbitt has at best, a press man’s insight into the Unionist Party and its ethos. As a celebrity import into the UUP leadership, he probably felt that he had to make an instant impact by delivering rapid and visible progress. The outcome of his striving is altogether different from what he intended. By treating his party as a product to be marketed rather than the political expression of a section of society, he has blundered disastrously and nowhere more spectacularly than when he consented to an agreed Unionist candidate for the Mid-Ulster by-election. With its very large nationalist majority, Mid-Ulster is not going to return a unionist of any shade or persuasion regardless of whether there is an agreed pro-union candidate or not. In other words, since there is no question of gifting the seat to Sinn Féin as the result of splitting the unionist vote, it would have been a perfect opportunity for the UUP to run its own candidate and demonstrate its independence and individuality. Instead, Nesbitt has opted not only to ‘tail-end’ the DUP but because of the background of the candidate selected, he has also contrived to turn the by-election into one of the most toxic campaigns imaginable. By selecting Nigel Lutton to run as an agreed Unionist candidate, the DUP and UUP believe they can undermine the Sinn Féin candidate Francie Molloy and maximise their vote. The Unionist parties undoubtedly intend playing up the fact that in 2007, the Democratic Unionist MP David Simpson used Parliamentary privilege to accuse Francie Molloy of involvement in the killing of the agreed candidate’s father, ex-RUC reservist Fredrick Lutton. Notwithstanding Molloy’s outright denial of having any part in the killing, the unproven allegation will be bandied about promiscuously. In itself, that would be a cynical ploy echoing the nastiest use of the Orange card. However, the damage will not stop at that. Sinn Féin, in order to balance the field, will feel obliged to brief (albeit surreptitiously) against Nigel Lutton. Mr. Lutton’s uncle Joseph has served a life sentence for UVF related killings in the Mid-Ulster area. Consequently, many Catholics in the area believed that the late Fredrick Lutton was asked to (rather than being offered the option) resign from the RUC. While none of this can possibly attach any stain to Nigel Lutton or his character, the nature of electoral politics in Northern Ireland will ensure that the Mid-Ulster by-election will now become, off-stage, an exhumation of the horrors of the killings of the 1970s, 1980s and 1990s in rural Tyrone and Armagh. Coming on the back of UUP supported flag protests, the fall-out from this campaign will linger long after the by-election is over and the agreed unionist candidate soundly beaten. Having stirred up the vilest passions and memories, Unionism will have found a common denominator in a poisonous brand of politics that the DUP does best. Mike Nesbitt and the UUP will have then to choose between merging with Paisleyism or watch the party decline into irrelevance due to it being surplus to requirement. Very few republicans or nationalists will regret the passing of the UUP and even fewer will celebrate its re-emergence as the DUP. 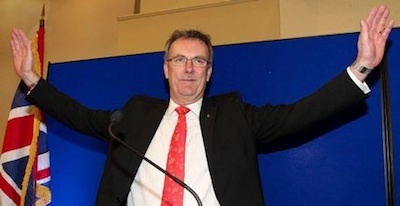 Nevertheless, if Mike Nesbitt is due any credit in all of this, it that he has at least cleared away any residual doubts about the incurably sectarian and reactionary nature of Unionism in Northern Ireland. To this extent only, is TV Mike a fitting successor to Carson, Craig and Basil Brooke.